A few of Trump’s voter fraud panelists have developed the capacity to feel shame. At the second meeting of Trump’s voter fraud commission, a handful of panelists developed the capacity to feel shame. 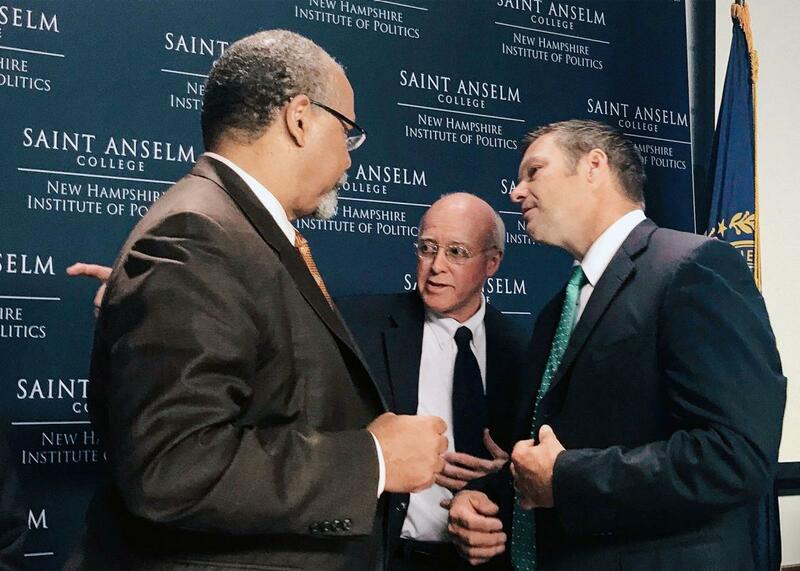 Former Ohio Secretary of State Ken Blackwell, New Hampshire Secretary of State Bill Gardner, and Kansas Secretary of State Kris Kobach talk during a meeting on Tuesday. Tuesday morning, Kobach arrived in New Hampshire for the second meeting of the Presidential Advisory Commission on Election Integrity, which he effectively heads. (Vice President Mike Pence technically chairs it, but he was not present on Tuesday.) He was seated next to commission member Bill Gardner, who has served as New Hampshire’s secretary of state since 1976 and is thus the man Kobach was accusing of overseeing a system so dysfunctional that its results were invalid. Gardner didn’t look happy. President Trump created the “election integrity” commission in May, apparently to bolster his delusional claims that “millions” of people voted illegally in the 2016 election. The stated purpose of the commission is to “strengthen the integrity of elections” by studying vulnerabilities, namely voter fraud. In fact, the commission is an elegant example of the observer effect: Its mere existence seems designed to destabilize public confidence in the American democratic process. There was something surreal about watching a government commission discuss a problem that essentially does not exist. Panelists displayed slides with mathematical models that predict voter turnout, the distribution of election jurisdiction size, and historical polling data. Two New Hampshire town moderators wheeled out wooden ballot boxes used in their local elections, a slide reading “If it ain’t broke, don’t fix it” looming over them. (The slide was somewhat undercut by their folksy anecdotes about how the paper ballots often become almost unreadably crumpled in the boxes, and how various elements are broken or held together by duct tape.) A Fox News commentator and independent crime researcher testified that election officials should conduct background checks on voters using the same Bureau of Alcohol, Tobacco, Firearms and Explosives database used to vet gun buyers. Democrats seem to have perfect faith in the background-check system for gun purchases, he pointed out, so why not use it on voters? What no one did was demonstrate that voter fraud is a widespread problem. Ken Block, the president of a data-mining company used by government agencies, testified about his new report about duplicate voting. Paul Gronke, director of the nonpartisan Early Voting Information Center at Reed College, estimated this week that even the report’s overly broad definition of voter malfeasance found a fraud rate of 0.000323741007194, or three ten-thousandths of 1 percent—almost exactly the chance that a person will be struck by lightning in the course of their lifetime. Kobach’s characteristically disingenuous Breitbart column, based on an analysis of voters who used out-of-state driver’s licenses in the 2016 election, clearly rankled several of his fellow commission members. The column failed to mention that New Hampshire law allows out-of-state college students to vote in Granite State elections. An earlier analysis by New Hampshire Public Radio found that the towns with the highest rates of out-of-state ID use at the polls last year were all home to college campuses. But the column likely pleased President Trump, who lost the state’s 4 electoral votes to Hillary Clinton and alleged “serious voter fraud” there in late November. He later privately complained to members of Congress that “thousands” of people took buses in from Massachusetts to vote illegally in the state. Busloads of Massachusetts residents at polling places are New Hampshire’s version of Bigfoot: often claimed to be spotted, yet somehow never photographed. During Tuesday’s meeting, Kobach soft-pedaled the column, emphasizing that it was only 800 words and saying he struggled over certain verb choices. That wasn’t enough for commission member Matthew Dunlap, Maine’s Democratic secretary of state. Saying “that somehow people not updating their driver’s license is indicative of voter fraud is like saying the fact that you have cash in your wallet is indicative that you robbed a bank,” he said. “I have an awful lot of faith in the integrity of elections in New England.” Gardner sat with his eyes downcast and told Kobach that the election results in New Hampshire are “real and valid,” drawing the first applause of the day. Kobach later said he stands by the column. Outside the meeting, which took place on the campus of Saint Anselm College, about 150 protesters yelled “Sham!” as commission members pulled into the parking lot. Jim Forrest, who serves as supervisor of the voter checklist in Franconia, New Hampshire, drove two hours to get there. He’s deeply familiar with the voting process in the state, and “this is just crazy,” he said. “Anything you do to inhibit the vote is going to inhibit the vote.” After New Hampshire Republicans passed a voter ID law in 2012, Forrest saw people enter the polling place, realize they forgot their ID, and turn around to leave, despite the fact that the law allows a voter who doesn’t have ID with her to cast a ballot if she fills out an affidavit and has her picture taken. It’s fair to say that Trump’s commission is split between opportunists like Kobach and legitimate public servants who should know better than to associate themselves with a body that is indeed a sham. Many of the protesters mentioned their disappointment in Gardner specifically. The 68-year-old secretary of state, a Democrat who has served under 11 governors of both parties, is widely liked and respected within the state. His main legacy is his fierce protection of New Hampshire’s status as the “first in the nation” primary, and even that seems perilous now. On Tuesday, former Democratic National Committee chair Howard Dean told the Daily Beast that the party would consider stripping the state of that honor over Gardner’s support for a new state law designed to crack down on “fraud.” The law, known as SB 3, would impose high fines and jail time on people who vote without proper ID and then fail to follow up with proof they live in the state. As the commission assembled at Saint Anselm, a state court ruled that the law’s penalties could not be enforced in that day’s special election. He should be. It is blazingly clear that the panel is uninterested in real election integrity and is only serving to bolster the legitimacy of people like Kobach and von Spakovsky. It’s time to isolate them, not sit next to them and politely hear them out.